At the siege of Ladysmith in late 1899 the Royal Navy (RN) gunners (who were serving ashore with 4.7-inch guns) reported that the range to distant targets changed during the course of a day. This was greeted with derision by those experts on everything the British media. Clearly neither had been studying the 1897 Text Book of Ballistics and the Reverend Bashforth's table relating air density to temperature and pressure. However, a RA officer, Captain JT Dreyer, investigated the phenomena. He calculated that the differences could be explained by changes in meteorological conditions. The result of his work, a mechanical Range Correction Calculator, was adopted by both the RN and the Royal Garrison Artillery (RGA) it included allowance for the movement of a target ship and a firing ship. The RGA manned the coast (anti-ship) artillery in fixed fortifications around Britain and abroad. Their circumstances gave them a keen interest in `technical' gunnery because moving targets (ships) had to be hit with the minimum of ranging before they were out of range (20 knots is 675 yards per minute). Dreyer also realised that differences in muzzle velocity (MV), caused by barrel wear, meant that guns of the same type did not perform the same as each other when firing at the same time. In 1904 he invented a sight that compensated for differences in MV from that given in the Range Tables. These were adopted by the Admiralty for all RN ships. The process of correcting for non-standard MV was called 'calibration', although during WW1 this term evolved to mean the shooting to determine the current MV. The RN started using it in 1905. During 1907-9 RGA conducted calibration trials involving 9.2-inch and 6-inch coast batteries in different parts of the world. This convincingly demonstrated that calibration improved accuracy and for coast defence the RGA adopted a range dial with compensating gear. It achieved earlier hits and increased the percentage of hits per minute leading to the assessment that it doubled the efficiency of their guns. However, it was not without argument, caused it seems by misunderstanding. Some officers thought calibration meant abandoning ranging, which it did not. Some indirect fire using fairly primitive methods was used during the Boer War, particularly by a few howitzer batteries. Firing from behind cover, typically just behind a crest, had been officially recognised before the war. In 1906 British doctrine made indirect fire the primary mode of artillery fire. At this time the main purpose of indirect fire was to protect the guns from enemy direct fire. By deploying out of sight of the enemy, the guns became difficult for the enemy to find, which made it difficult for the enemy to attack them. Recognition that indirect fire meant that, given appropriate fire control, guns could attack targets anywhere in range emerged more slowly. The underlying assumption in this period was that any war would be one of movement and meeting engagements. Furthermore movement was mostly at the speed of marching infantry and horse drawn artillery. Batteries trained to deploy and engage targets quickly, the expected targets were `troops in the open'. Of course these troops could be cavalry, artillery and even engineers as well as infantry. The Royal Horse Artillery (RHA) and Royal Field Artillery (RFA) only fired shrapnel shells and their modern quickfiring (QF) guns (13 and 18-pdr Guns, and 4.5-inch Howitzer) had maximum ranges between 5,500 and 7,200 yards. The 13 and 18-pdr Guns, introduced in 1906, had maximum elevations of only 16� on level ground. This limited their ability to fire from close behind cover and to engage targets similarly positioned. There were a small number of heavy guns and an even smaller number of siege howitzers provided by the RGA to the field army that had HE shells. Just at the outbreak of war the first 9.2-inch Howitzer (`Mother') appeared, this too used HE. Nevertheless RGA heavy guns (4.7-inch and 60-pdr) assigned to the field army used RFA procedures in accordance with Field Artillery Training (FAT) although their siege guns (6-inch How) used Garrison Artillery Training (GAT) Vol 2 (Siege). RHA, RFA and RGA were organised into batteries of 4 or 6 guns and there were usually 3 batteries to a RHA or RFA brigade (ie `battalion'), RGA batteries were `un-brigaded'. FAT first appeared in 1902 and there were revised editions almost every other year until 1914, most of the evolving changes concerned fire tactics. It stated that the battery commander (BC) was responsible for fire discipline, fire tactics and for directing and controlling the fire of his battery, but could delegate fire discipline to the next most senior officer. At this time fire discipline meant bringing the battery into action and delivering fire while fire tactics meant selecting battery positions and targets. The 1906 edition of FAT was the first to provide procedures for true indirect fire as well as guns just behind a crest against a target that was visible from the crest. FAT stated that gun laying could be direct or indirect and promulgated indirect fire methods for gun laying. It broke the problem into two elements, elevation (or range - the distance between the battery and target, and its corresponding elevation angle) and direction (or azimuth, line, orientation or bearing). Indirect laying for elevation could be by directly aiming at an aiming point in the area of the target or by `placing the gun at an inclination using the clinometer'. Laying in direction was by two aiming posts close to the gun and in line with the target or by aiming at a distant natural object (an aiming point) in line with the target. In either case a simple horizontal deflection scale enabled fire to be aimed a few degrees either side of the aiming post or aiming point line. This could be done with the normal 'sighting telescope'. In the Boer War guns had aiming posts and clinometers but some batteries developed their own deflection sights, usually called `gun-arcs'. Some continental armies had starting using angular sights earlier in the 1890's and it's possible that the Boers had some with their modern guns (although photos don't show them), and most of their guns were captured by the British in the first half of the war. By the mid 1900's two types of horizontal gun sight were available for British guns, the older `gun-arc' or the newer `goniometric sight'. The first was initially an open sight with a lateral deflection scale offering about 5� left and right so it required the aiming point (AP) to be close to the line between gun and target. 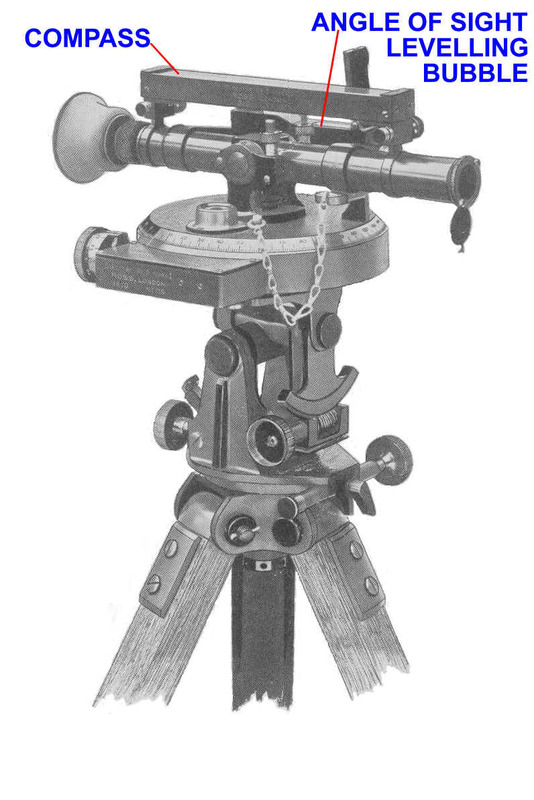 The goniometric sight, renamed `dial sight', had a rotating (ie `panoramic') head and could cope with an AP in any direction relative to the target. Further information on the Laying and Orienting the Guns page. Initially FAT was somewhat ambivalent about the new goniometric sights. It implied they were not really essential because there would always be a suitable aiming point close to the gun to target line and the gun wouldn't physically move much while firing. There was an implication that guns wouldn't remain in a position for too long so wouldn't fire at many different targets from any one gun position. In or close to the battery position. A short distance from the battery where he could observe and direct fire. Detaching an `observing party' (OP) some distance while remaining on the battery position himself. This required visual signalling (heliograph or flags) although field telephones were being tried. The next problem was to use a dial sight and an aiming point in any direction to aim the guns at a target. This meant all the dial dights in a battery being oriented in a known angle relative to the AP and parallel to one another, this required a Director. A director measures horizontal and sometimes vertical angles. It comprises a sighting head and a horizontal scale, in the British case this was graduated as a 180� left and right with a micrometer scale that measured 5 minutes of arc in a degree. The telescope rotates on the horizontal scale and the scale itself rotates on and can be locked to the mounting. This means the horizontal scale can be oriented with zero pointing in a direction, such as North, an AP, a target or anything else, and angles then measured from it. More detail is here. The dial sight also had a horizontal scale very similar to the director. 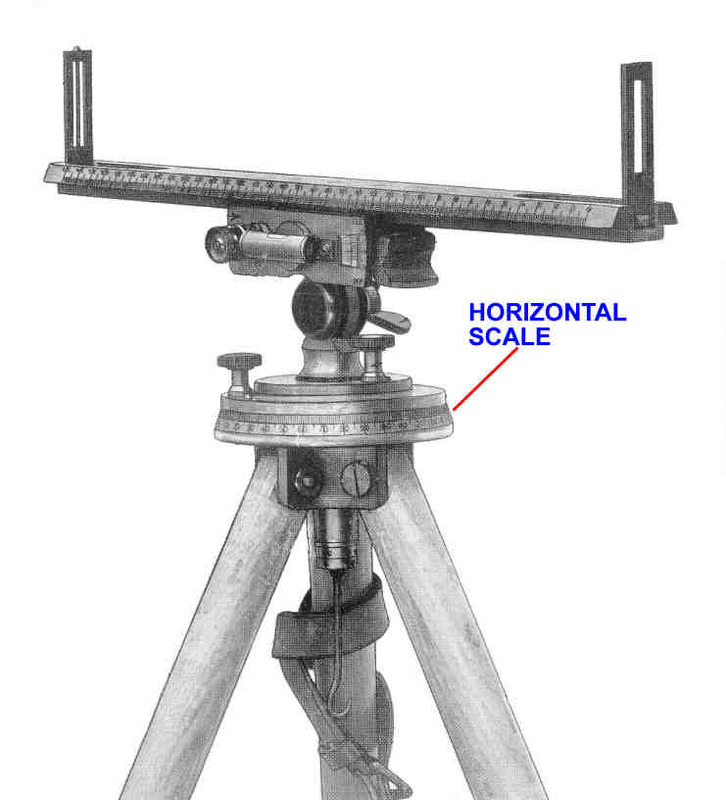 However, the sight mount was such that when the scale was set to zero the view through the sighting head was parallel to the horizontal axis of the bore. This meant that an angle set on the sight was in effect an angle from the line of the barrel. If the BC was close to the battery and there was an AP visible to himself and the guns he used the director and measured the angle between the AP and the target. This angle was then ordered to the guns. After laying the gun with the dial sight on the AP at the ordered angle, the sights were aimed at the director and the angle recorded without moving the gun. The director was then used as the aiming point instead of the AP. If tangent sights were used each gun planted its pair of aiming posts in line with zero. All this was in case the AP in the target's vicinity became obscured. If there was no suitable AP and the BC was close to the guns he pointed his director, set to 180�, at the target then measured the angle to each gun and ordered these angles to the guns. The guns each aimed their dial sight at the director at the angle ordered, so their barrels were parallel to the line between the director and the target. This method grew in importance and eventually became the only method of orienting the guns in normal circumstances. It was called the `individual angle method'. In either case the BC estimated the range from guns to the target, which was set on each guns' range indicator and the bubble of the sight clinometer was then levelled. Basic survey methods were used for this and in 1913 one-man optical range-finders were introduced. If the battery had howitzers the BC also ordered the charge to be used. However, as ranges increased the likelihood of the target being visible from a director near the battery decreased. If the BC at the guns could not see the target then there were again options. If he could estimate the range and deflection from the AP then the OP could range the battery onto the target. However, if the BC was unable to estimate direction and range then both OP and BC used directors and the Target Observer Battery� (TOB) method . This depended on the BC's director being positioned close to the guns and able to observe the OP and the distance from the OP to both the target and to the BC's director being found by estimation, rangefinder or the map. The OP measured the angle between target and BC's director and estimated the range to each. This was sent to the BC who used either the field plotter or trigonometry to calculate the angle TBO and the range to the target. If the BC's director was not the guns' AP then the TBO angle had to be converted into a deflection from the AP by adding or subtracting the angle between OP and AP. This process also enabled `brigade control', the OP being the RFA brigade (equivalent to battalion) commander signalling his measurements to all his batteries. Unlevel trunnions, early sight mounts could not be levelled to make the dial sight vertical, a simple calculation took the height difference between a gun's wheels and derived an angular correction for sight cant. Each guns' detachment commander, the `Number 1', was responsible for this and for applying it to angles ordered by the BC or OP. This changed as oscillating sights were introduced from about 1910. If the AP was close then guns' would not be parallel, various quick calculations were used to correct for this. If necessary the BC would order an individual correction to each except the right hand gun, which would always applied by each gun. Lines of fire diverged if the AP was to the rear and converged if to the front, and the corrections were order as `concentrate' or `distribute'. Drift, spinning shells drift to left or right by a known amount, however, most guns of this period compensated for this by having slightly tilted trunnions, in some cases a variable setting on a Drift Scale Plate. Each Gun Number 1, the detachment commander, was also responsible for measuring the angle of sight to any crest to his front, and then converting this to a safe minimum range to ensure `crest clearance'. The BC or OP ranged the fall of shot onto the target, this could be using the entire battery, a section (2 guns) or a single gun. The adjustments were deflections relative to the AP and corrections to range and applied directly to the guns' sights. This meant the observer had to imagine his battery's line of fire through the target, the relatively short ranges and likelihood that he could see both target and guns, made this fairly simple. To adjust for range the observer ordered corrections to achieve a 300 yard bracket of the target and then moved the fall of shot 100 or 200 yards to correctly position it. 300 yards was the spread of shrapnel bullets on the ground along the line of fire at the optimum height of burst. The shrapnel burst height was found by adjusting the fuze length. This was ordered as a corrector applied to each guns' Fuze Indicator with the range to the target. Each gun detachment then read their fuze length from their Fuze Indicator. Open - where targets were visible through the guns' sighting telescopes or open sights. Semi-covered - flash cover for the guns but control by voice, with the implication that the BC did this and was able to observe the target. Covered - guns concealed and control required `artificial' means such as telephones, signalling and plotters. Also at this time the angle of sight was recognised as a significant issue. Perhaps dubiously given the generally approximate nature of range estimation. However, getting the angle of sight correct was important for ranging or using a previously ranged corrector setting, this was vital for getting shrapnel to burst at the optimal height. It led to the introduction of an `Angle of Sight Instrument' to measure it. The first instrument was handheld but was soon followed by an adaptor so that it could be fitted to a director. The angle of sight was ordered to the Number 1. Always allowing for angle of sight between guns and target (ie the difference in their height). Using deflections for moving targets and to allow for wind (the 1906 edition left this to `observation'). Using an auxiliary AP for round to round gun laying instead of the director. The main change to fire control procedures was recognition that a common AP and angle for all guns did not result in parallel guns if the director was not to the flank on a line through all guns (straight line gun positions were used whenever possible). The solution to this was tabulated corrections to be applied by each gun when recording their aiming point. GAT 1911, went slightly further and dealt with deflections to converge the fire of guns onto a point instead of firing parallel. The Slide Rule Mk 6 provided their means for calculating this. However, individual angles to each gun remained an option if the director was not on the line of guns. In this case the director had to be at least 80 yards from the guns. This method was not popular because it took longer to orient guns individually than the other methods. Another variation was to orient one gun accurately then order the other guns `parallel lines' to it, the oriented gun in effect acted as a director for the others. A further edition of FAT was issued in early 1914. It gave data for estimating corrections for wind. These corrections were provided for 1000 yards of range, so the observer had to multiply them, but first he judged whether the wind was `very strong', `strong', `fresh' or `moderate' and its direction in relation to the line of fire. For 18-pdr a very strong cross-wind required a deflection of 15 minutes per 1000 yards of range. Howitzer deflections were slightly greater because they had lower velocity shells and a longer time of flight for a particular range. The observer applied these corrections to the deflection from the AP that he ordered to the battery. FAT 1914 also provided guidance on the use of airborne observers, including signalling codes. It placed increased emphasis on keeping the guns parallel and provided tables to calculate corrections for individual gun angles to an AP. It also allowed the BC to order a line of fire as a deflection from magnetic North (ie `magnetic bearing') and for guns to be given an individual angle from the battery director. By this time directors had been fitted with a prismatic compass. Obviously a BC would often be in a position where he could mark target, battery and AP on a map and so measure the deflection and distance for his battery. However, this was considered underhand (ie `not cricket') by RHA and RFA and only used by occasional mavericks in live firing practices at this time. Nevertheless accurately estimating ranges of several thousand yards was difficult (some might say impossible for normal mortals) and in 1913 issue of optical range finders started. Range Tables were published before 1914 for all guns and howitzers. However, compared to later editions their content was sparse, basically range, elevation and drift. Nevertheless they did use `standard conditions'. These were defined as no wind, barometric pressure 30 inches of Mercury and air and propellant temperature 60� Fahrenheit. However, there was no suggestion of any need for corrections if the current conditions were different, ie `non-standard'. FAT and Range Tables were not the last official word on non-standard conditions. The `Text Book of Gunnery' Parts 1 & 2, published in 1914 and 1911 provided considerable technical detail. This included internal and external ballistics, gun construction and various ballistic tables. In particular Part 1 gave a table of relative air density that reflected the fall in air temperature and pressure with height and Part 2 provided nomograms to calculate the percentage change in ballistic co-efficient for changes in temperature and pressure. However, there were also unofficial publications. Foremost among these were the three editions of `Modern Guns and Gunnery' by Major HA Bethel RFA published 1905-10. These gave two methods of calculating corrections for wind and how to correct for charge temperature different from standard. They also included a more comprehensive method, using data tables in the `Textbook of Gunnery', which started with calculating the ballistic coefficient for the day. At the beginning of 1914 the Royal United Services Institute Journal published an article `More accurate methods with Field Artillery' by Major H Rowan-Robinson RA. Its publication may have been indicative of the interest is this matter. The author highlighted the improvements in accuracy being made by coast gunners and by the Royal Navy. He cited recent campaigns in various parts of the world where at a range of 4000 yards typical corrections to range varied between shortening 600 and lengthening 200 yards. He challenged the field artillery view that calculations meant slowness by pointing out that the goal was not to fire quickly but to get to effective fire quickly. His solution was to provide range cards giving the corrections needed for a change in temperature of 10� F and 1 inch in barometric pressure, together with corrections for wind, at all likely fighting ranges. Batteries would carry a barometer and thermometer. However, he also assumed that barrel wear would be insignificant in war and therefore corrections for loss of muzzle velocity could be ignored. The pre WW1 period established a characteristic of British gunnery that lasted until the introduction of digital computers. The amount of 'calculation' that was done at each gun compared to some other armies. Range was ordered to guns which was set on their sights or their fuze indicators, instead of calculating the elevation angle and fuze length elsewhere. A correction for trunnion tilt was determined and applied by each gun together with a correction for parallelism if an AP was used for orientation. Second, while there were technical influences pulling to keep the BC with his guns, his responsibility for tactical fire control meant that he had always to think about effectively engaging the target. It had always been recognised that tactical fire control was vital and was the commanders' responsibility. The best place for tactical fire control was from forward where the targets could be seen. Not all armies grasped this concept. Copyright � 2006 - 2015 Nigel F Evans. All Rights Reserved.